A Royal Navy Shoulder Title in cloth. Paste back example in near mint condition. Measures 4 1/4" x 1" Have a few of these in stock. 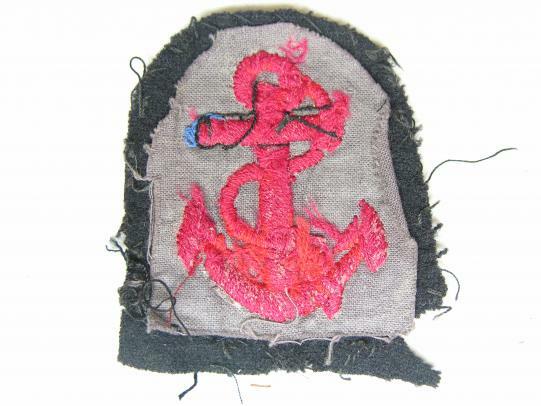 RN Leading Seamen cloth sleeve badge. in good condition with a hessian backing. R.N. Leading Seaman Sleeve Rating, used and removed from uniform. Lot consisting of four ships patches, four Squadron patches all in mint un-issued condition. 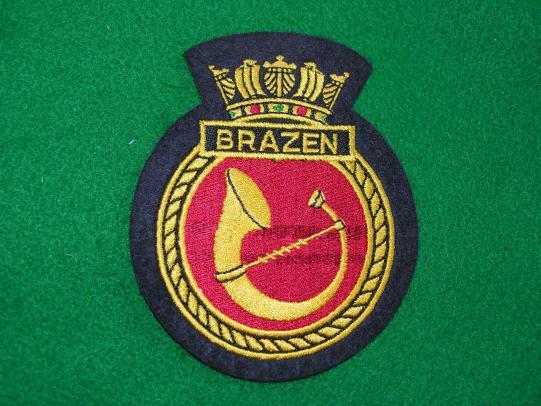 A RN Submariner blazer badge in bullion thread. Fully embroidered badge in mint condition. HMS Arrow was a Type 21 frigate of the Royal Navy. Arrow participated in the Falklands War, engaging with Argentine aircraft, a submarine, and firing at land forces in Darwin, Goose Green, and Mount Longdon. She also rescued most of the surviving crew of HMS Sheffield. Measures 4 1/2" x 3 3/4"
Following a patrol in the South Atlantic Brazen ran aground in the Patagonian Canal on 11 September 1994. The ship was refloated four days later and taken to Talcahuano for repairs, which lasted a month. She then returned to the UK under her own power for reinstatement of combat system equipment damaged in the incident. She was purchased from the United Kingdom by the Brazilian Navy on 18 November 1994, and renamed Bosísio. The ship was commissioned into the Brazilian Navy on 30 August 1996. HMS Newcastle was a batch 1 Type 42 destroyer of the Royal Navy, launched in 1975. Newcastle was decommissioned on 1 February 2005. Measures 4 2/2" x 3 3/4"
HMS "Jupiter" Royal Navy Destroyer Frigate Class Fleet Patch. Prince of Wales appointed as the Ships Communications Officer.